“The Bridge” Exhibition which started in Paris France well over a year ago, is winding down in Wyoming. This show has traveled around the world and the U.S. and Lander was one of the fortunate locations on the roster. The meaning of this art exhibition touches me personally as I have in my travels and a few years spent in the Middle East found a love for mixed cultures and beliefs. We do all have a lot more in common than we have differences. The Bridge is just that,..a bridging of the Christian, Islamic, and Jewish faiths. Lander will have had 5 events in honor of this exhibition by mid October, and it was a pleasure to assist on the evening of the Art Crawl, and an honor to have my icons displayed at one of the locations. One event was a showing of “Blue Like Me”, a movie about artist Siona Benjamin and her life as a Jewish Indian. Check out this film. Siona was one of the artists that traveled to Wyoming. 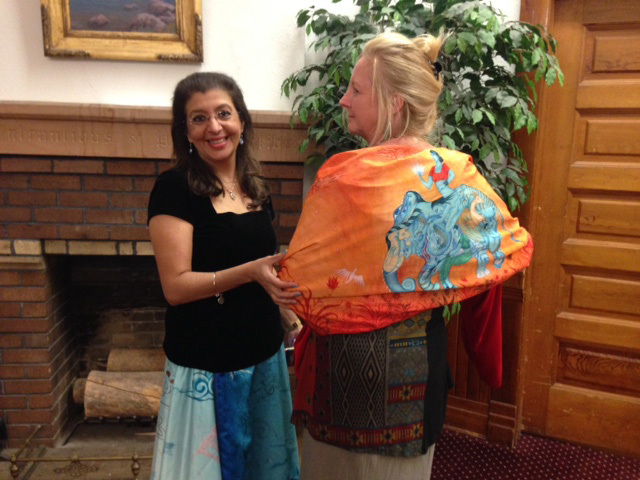 Here I am wrapped in one of Siona’s beautiful shawls. Hopefully the message depicted in the art from this exhibition will linger,…a message of Peace to All.